When I was younger and got invited over for slumber parties, I was always excited to see my friends’ bedrooms for the first time. 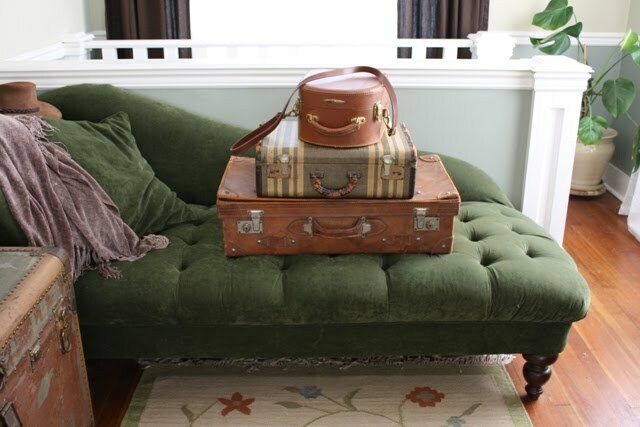 For one, I always shared a bedroom so the idea that someone might have their OWN room was nearly incomprehensible, and two, how they decorated and whether they had a window seat (bay window) was of utmost interest. And if they had a day bed, well oh my gosh, your life is amazing! Fast forward to 2010. Not only do my friends have their own rooms, but their own houses! Yes, I’m still equally, if not more, enthralled. From vintage furniture, to Kitchen Aid pasta or ice cream attachments, to vegetable gardens, I love to see how my friends do it. Last month when Kelly had to get rid of all mostly all her stuff for her move to Paris, it got me thinking about the things I would want to take with me, and items that have traveled with me from move to move over the years. These things have taken on identities of their own, like old friends, and become my sense of home. I know I'm talking about objects, things, material possessions, temporary items in the grand scheme of the world, and sure, I would be fine without them, but I do enjoy them. I thought I would share some of my favorites with you, so you can take a peek into my little old house. But I warn you, by looking at these pictures, I fully expect you to share a list of your own dear possessions. When I moved into my current place I owned nearly no furniture, had no plates, silverware, etc. Driving home from work during the first month at the new place, I saw this coffee table on the side of the road with a sign that said FREE. Also on the table was a big basket that contained a set of enamelware plates, bowls, and cups, some glass food storage jars, and a set of nesting serving/storage bowls. Thank you, God! I loaded my car with the goods and smiled all the way home. Not only do I find this table super cozy, but it reminds me of that moment of feeling really blessed- my needs we're met in an unexpected way. I also love that its already old and broken in, so it exudes "kick your feet up and relax." I could probably fix it up a bit, but I like it how it is. Sometimes I'd rather have things I don't have to worry about ruining. 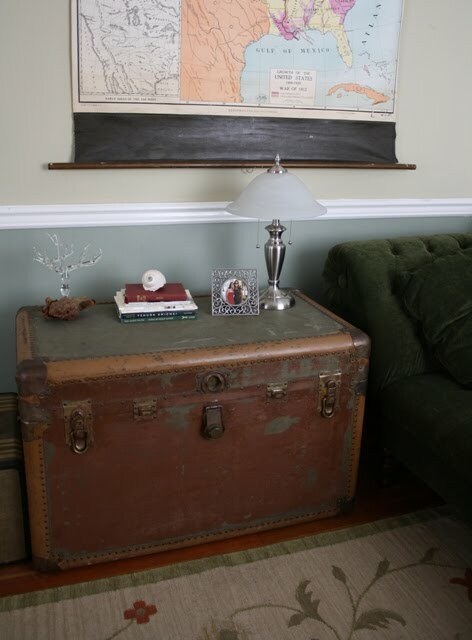 Okay, this is a new addition to my home, but I will remind you that I have been on the hunt for a vintage school map for years. Back in March I found a woman on Craigslist who had several for sale. I spent an hour at her house just looking at all of the old maps and trying to choose. This one shows the territories during the War of 1812. I'll admit I'm not a huge history buff, but I think it's beautiful. 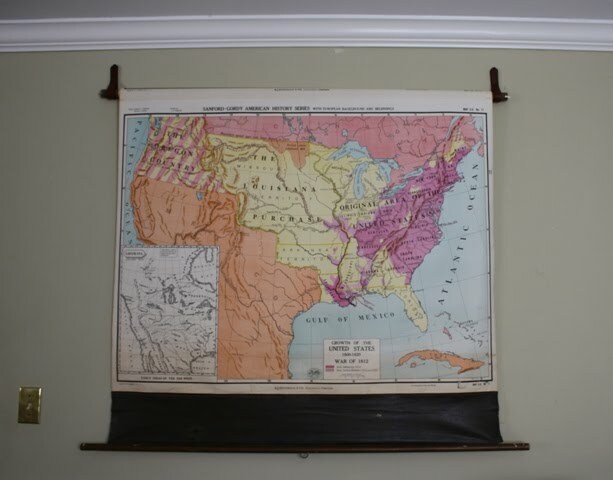 I used an old leather belt to mount it to my wall. My dad bought this for me at a swap meet years ago. I might have been in junior high at the time. I remember getting out his electric sander and sanding off the rough spots to make the paint smooth. I love the way this trunk smells when I open it up. Old and musty. Its distinct, and when I open it I think of when I opened it the first time in my parents' garage. I now store my Christmas decorations in it, so opening it also has that sense of excitement for the Christmas season. So that's mine. What are your favorite things? I loved this post. I also like to see rooms/houses for the first time. It is interesting how they reflect the owner's/renter's personality. One thing led to another and that is how I found your wonderful blog! One of my favorite pastimes is to type in a country on google maps and voom in and out...sometimes it leads to me scroll over to California, then up to Pullman where a neighbor just came back from studying abroad, then I thought where the heck is Snohomish actually located. "Somewhere near Seattle" was all I knew! Then I thought to look you up on fb. Since we aren't "friends" in the fb sense I could only access your wall, which brought me to, "Avery's visit to Seattle" and lovedog ranch! I really enjoyed reading this entry. Currently I love looking at furniture and kitchenware...I laugh sometimes because 'that' kind of shopping used to give me a headache. 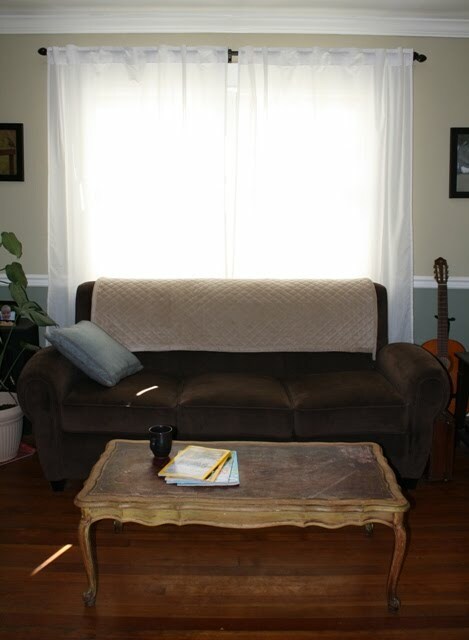 What you said about the used coffee table really resonated with me, it somehow implicitly gives us "permission" to use comfortably, since we aren't concerned about that first scratch or stain! I will surely stop by your blog every once and a while. Also I looked at your shop and was highly impressed! Well if you are planning to come to Europe anytime soon, just let me know! Hope all is well, happy 2012!